Next year, an eco building with 1,100 trees will absorb 25 tons of CO2 per year and produce 60kg of oxygen daily in smoggy China. Big trees fascinate me; the older and bigger, the better. They’re so beautiful, and so majestic. If you’ve seen my Barefoot Luxe Facebook page, there are quite a few posts of beautiful trees. If you’ve seen Lord of the Rings, you’ll know that some of the wisest and most powerful characters are the giant tree people, the Ents. This is what happens when Ents get mad. Don’t make them mad. The Ents are repositories of centuries of wisdom, generally mind their own business, stay calm and carry on as long as they’re left in peace. But when their tree world is threatened, and they see their tree community abused and killed, they come out to save the forest and save the world. Now isn’t that an inspiring message? And oh, so relevant. So naturally, I’m fascinated by this new project coming up in China, called the Nanjing Green Towers, also known as the Vertical Forest Nanjing. What is the Vertical Forest Nanjing? It’s an architectural concept based on the Vertical Forest Milan. Vertical forests are a concept pioneered and built by Italian architect Stefano Boeri in Milan. Concerned with urban development’s effect on nature, Stefano Boeri came up with the idea of giving back to nature with the concept of urban towers covered with trees and plants that produce fresh oxygen in the middle of the city while absorbing carbon dioxide. His company Stefano Boeri Architects designed Bosco Verticale, known as the Vertical Forest Milan, which is said to be the prototype of the skyscrapers of the future. Day time in Nanjing. From what little you can see of the sun, it looks like it should be about noon, but who can tell with all that smog. Doesn’t this image look strangely like the above scene from Lord of the Rings? How macabre. Now Stefano Boeri Architects is bringing the vertical forest concept to the sadly polluted industrial city of Nanjing, China with the Nanjing Green Towers. 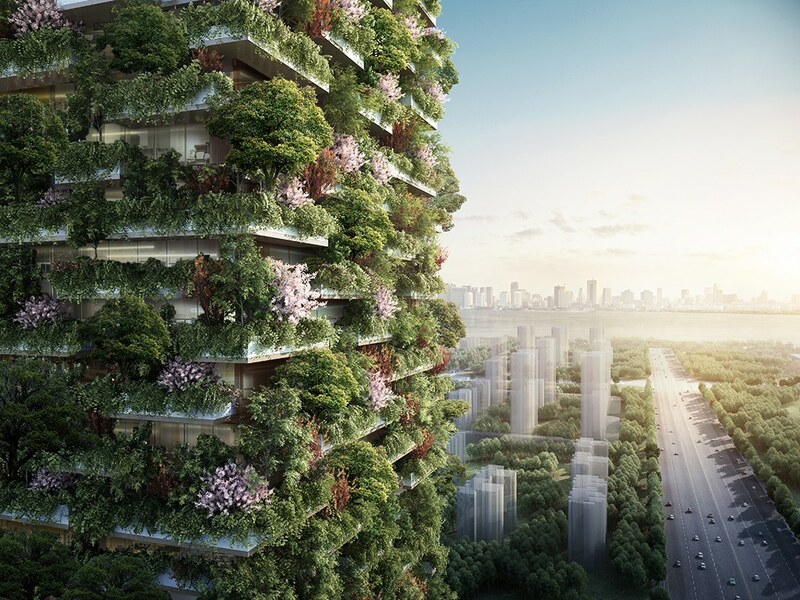 Its two green towers could provide the city with a breath of fresh air. Its 1,100 trees and 2,500 cascading shrubs and plants will produce oxygen while absorbing carbon dioxide to help alleviate some of the city’s devastating smog. Using 23 species of local plants, the project will help regenerate local biodiversity, provide 25 tons of CO2 absorption each year and will produce about 132 pounds or 60 kg of oxygen per day. The two forest towers will host offices, shops, restaurants, a museum, a green architecture school, a rooftop private club. a Hyatt Hotel and a rooftop swimming pool. This is the first vertical forest project in Asia, with more to follow in China in Shijiazhuang, Liuzhou, Guizhou, Shanghai and Chongqing. More projects will follow in the rest of the world, all designed by Stefano Boeri Architects. Not only does it sound amazing, it looks amazing. I’ll be looking forward to seeing that Hyatt Hotel when its ready to open. I wonder if it’ll be eco-friendly on the inside as well. The project is currently under construction and scheduled to finish in 2018. Have you been to Nanjing? How did you find the air quality there?